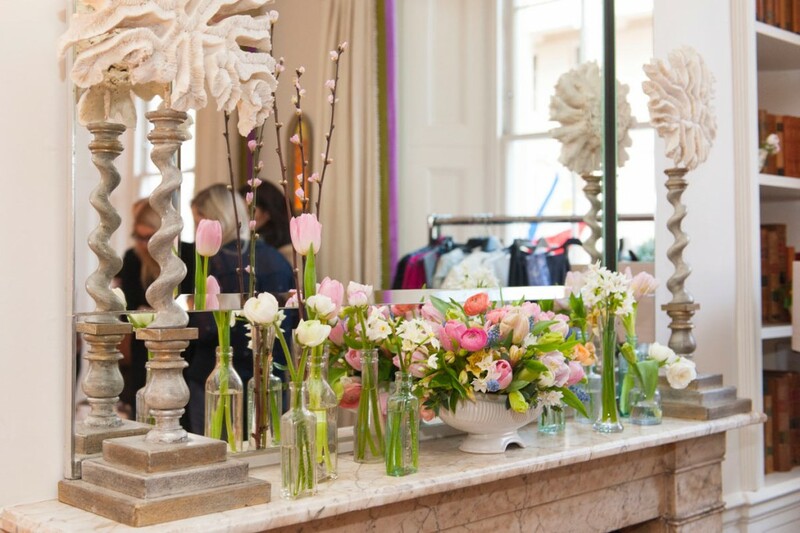 I was delighted to be asked by the events company Hel’s Angels to design the flowers for Claire Richards’ second collection for Fashion World at the beautiful Haymarket Townhouse, part of the Haymarket Hotel. The theme was an afternoon tea party, styled by Hel’s Angels’ Jennifer Dalby, and the colours to compliment the clothes range were pastel shades of pink, green and blue. 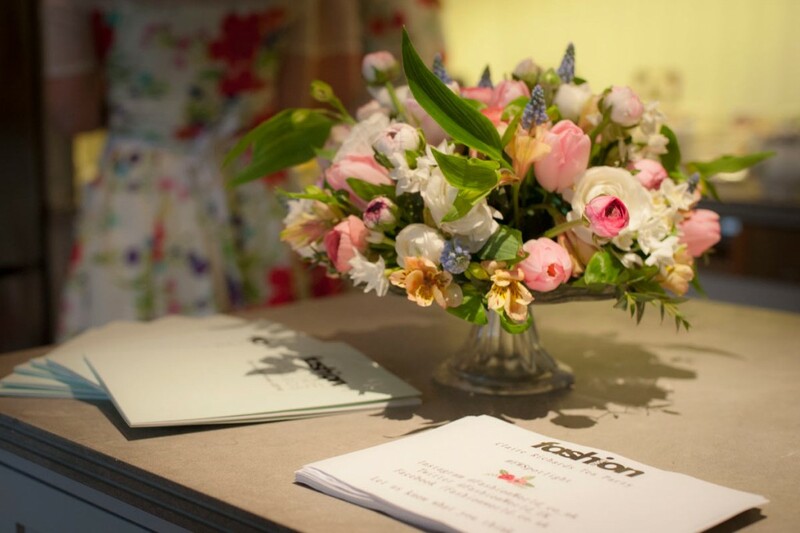 I choose flowers that were seasonal and English where possible, which highlighted the vintage feel. I used English-grown Alstroemeria, a flower which has not been particularly in vogue over the last few years, but which I think deserves more attention. There are some beautiful colours, they last a long time and are English-grown at this time of year, so win, win, win! as far as I’m concerned. It’s time to big it up for the Alstroemeria. On each mantelpiece I used vintage Fulham Pottery and Wedgewood urns which complimented the flowers perfectly. Mantelpiece arrangement: Central urn of tulips, Alstroemeria, grape hyacinth and Ranunculus, flanked by tulips and narcissi in medicine bottles. 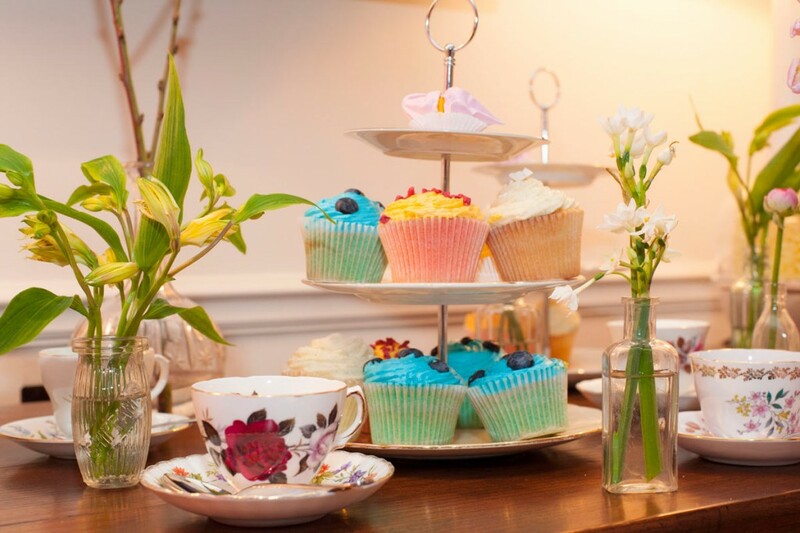 Old medicine bottles filled with several stems of each flower were scattered amongst vintage china cups filled with jelly, pastel-coloured macaroons and delicious cupcakes. Glass cake-stands topped with flowers sat amongst iced cakes, and the odd shoe, to create a truly wonderful event.